Happy International Sandwich Day! If you feel like celebrating all day long, we have picks for breakfast, lunch and dinner. These sandwiches will have you licking your lips. Pastrami Croque Madame Sandwich: Don’t forget breakfast is the most important meal of the day! Taste the flavor of Bechamel, pastrami, aged white cheddar, dijonaise served on PROOF sourdough; baked and topped with an over easy egg. Pesto Chicken Sandwich: At Joe’s Farm Grill the ingredients are fresh off the farm. 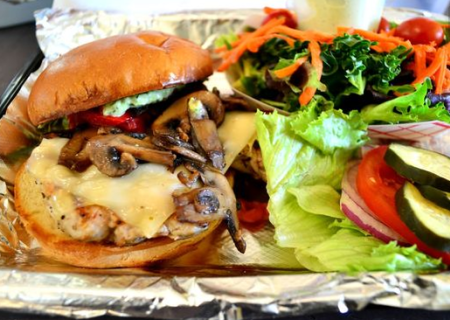 Stop by for lunch and enjoy this juicy chicken sandwich with Swiss cheese, roasted red pepper, grilled mushrooms and farm-made pecan pesto served with coleslaw. Hawaiian Pulled Pork Sandwich: Whether it&apos;s your first or last sandwich today, say aloha to Sandwich Day. Bite into slow-braised pulled pork, pickled slaw, grilled pineapple, sweet ‘n’ spicy sauce and Swiss cheese. Served with fresh-cut chips. Wherever you choose to celebrate Sandwich Day in Mesa, we want to see your eats. Use #VisitMesa on social media.